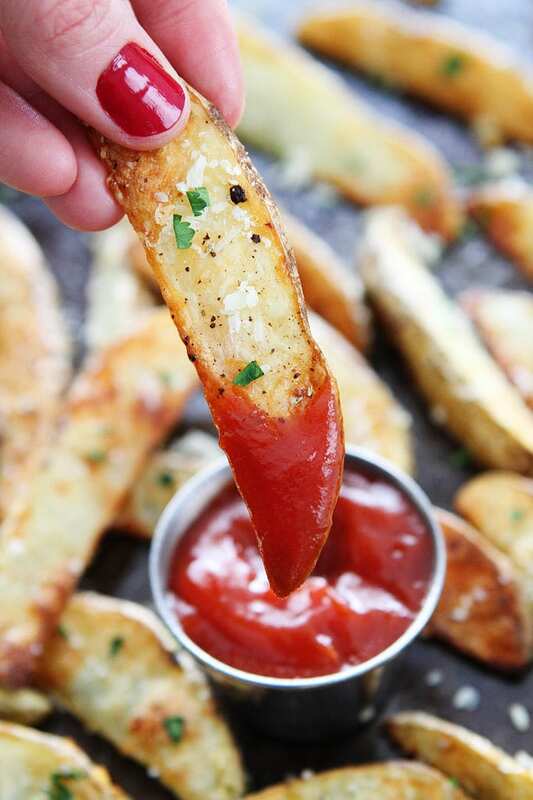 Baked Garlic Parmesan Potato Wedges – these easy baked potato wedges are our favorite fries! 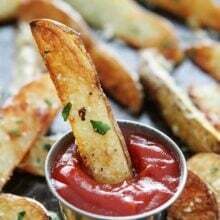 They are crispy, cheesy, garlicky, salty, and perfect for dipping in ketchup or your favorite sauces! I usually crave sweets more than salty foods, but put a plate of hot French fries in front of me and I will have a hard time resisting one or two…or a big handful. Our boys looooooove French fries. Put a plate of fries in front of them and they won’t make a peep. They will devour them and have ketchup all over their cute little faces. 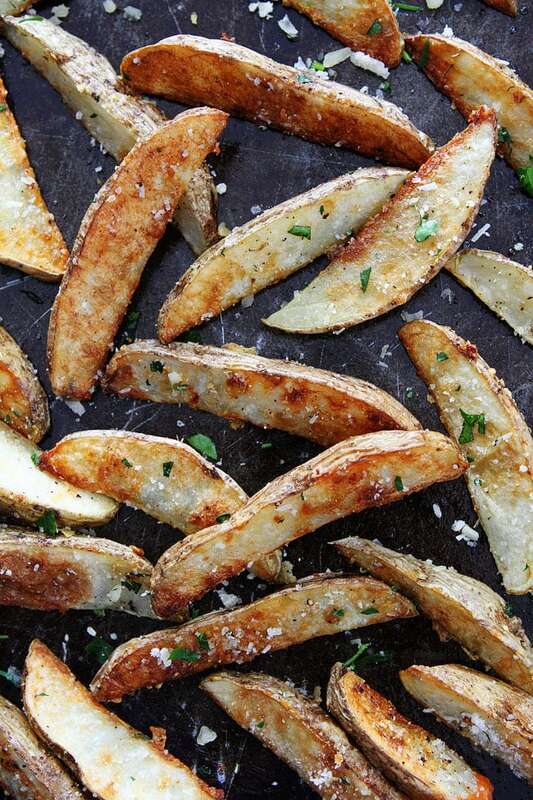 Our favorite fries are these Baked Garlic Parmesan Potato Wedges. 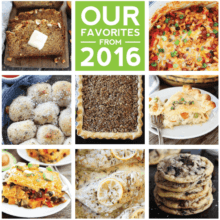 They are baked in the oven, not fried, but you will never know it because they are SO good! I love these potato wedges because they are baked, but still crispy! The secret? We soak the potato wedges in ice water for 30 minutes before putting them into the oven. I know it sounds kind of crazy to put the potato wedges in water to make them more crispy, because you think it would make them soggy, but nope! Soaking them in water removes excess potato starch and makes the potato wedges extra crispy! 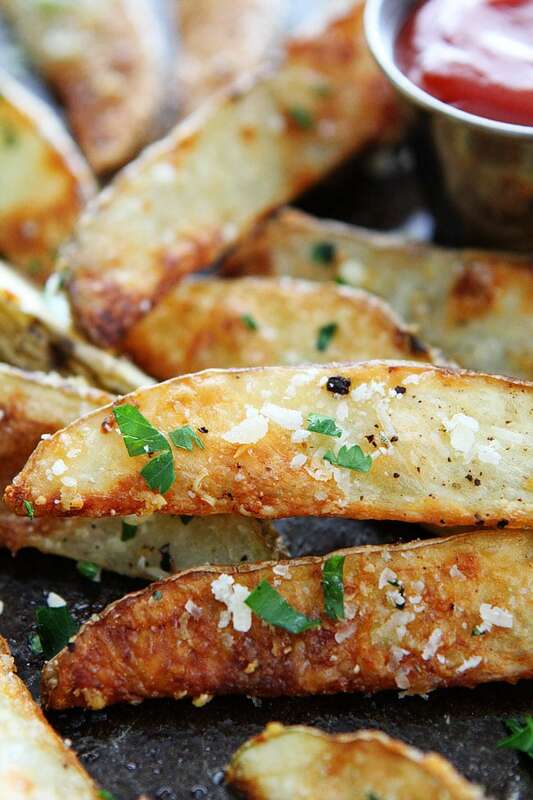 When the potato wedges are done soaking, we toss them with olive oil, garlic, rosemary, and grated Parmesan cheese. The, season with salt and pepper and go ahead and bake the potato wedges at 425 degrees until crispy! When the potato wedges come out of the oven, I dress them up with a little freshly chopped parsley. Serve warm and dip in your favorite sauces! 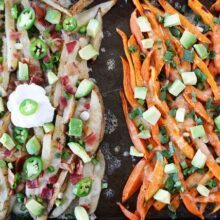 Serve these crispy Baked Potato Wedges with Garlic Parmesan as an appetizer or alongside any meal! They are our favorite fries and I think you will love them too! These easy baked fries are our favorite! You will never know they are baked because they are so crispy and delicious! Place the potato wedges in a large bowl of ice water. Soak for 30 minutes. While the potatoes are soaking, combine the olive oil, garlic, and dried rosemary in a small bowl. Drain the potatoes and pat them dry with a paper towel. Place the potato wedges back in the bowl. Drizzle the olive oil and garlic mixture over the potatoes and gently toss until wedges are well coated. Place potato wedges on the prepared baking sheets, in an even layer. 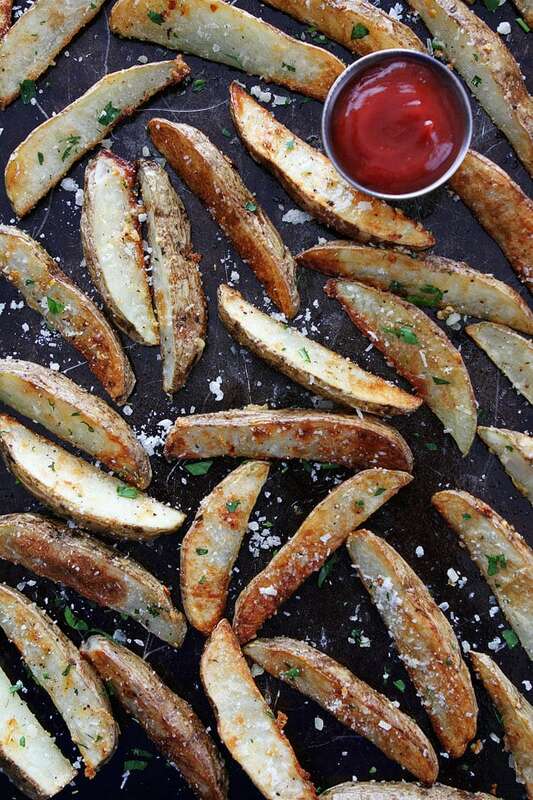 Sprinkle 1/4 cup of the parmesan cheese over potato wedges and season with salt and pepper, to taste. Bake for 35 minutes, flipping halfway, or until the potatoes are crisp and golden brown. 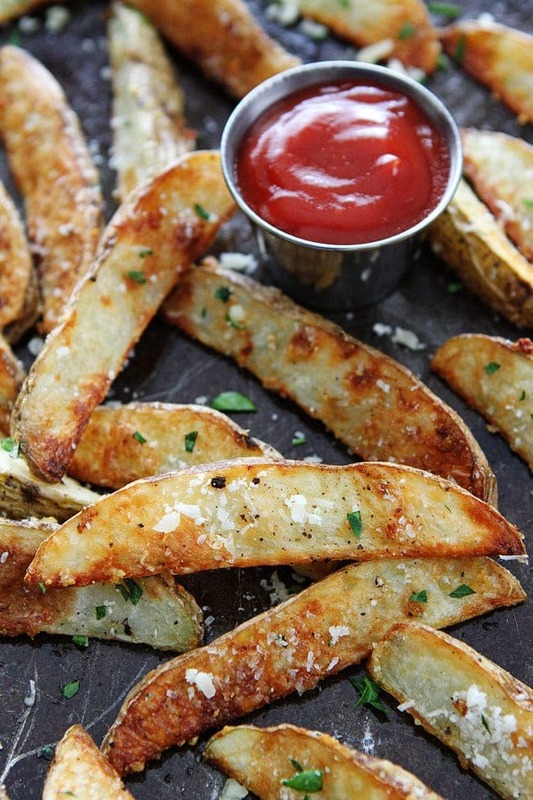 Remove from oven and sprinkle the remaining parmesan cheese over the wedges. Garnish with chopped parsley. Serve warm with ketchup or other sauces, if desired. mmmmmmmm these look amazing! I love roasted potatoes in any form. I am always on the hunt for a good french fry recipe! These looks off the charts! 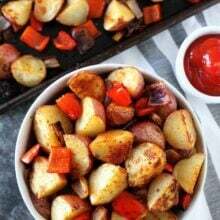 Roasted potatoes totally have my heart and I LOVE the addition of garlic and Parm! These look perfect! I want these so bad right now! How many wedges per small potato? We got 8 wedges per potato. 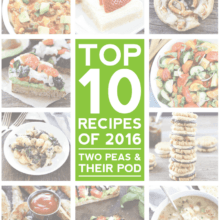 Will someone be answering my question or are comments just for the recipe? Thank you for that info !!!!!!!! French Fries are my kryptonite! and these looks awesome! These were delicious! A big hit with our family of 7. Glad you liked the recipe!! I need to try your genius ice water trick ASAP! The flaky salt on these is to die for!! That is pure brilliance to soak them in ice water before baking! I’m totally going to try these, as fries are my weakness, so if I can bake them rather than fry… well, that’s all the better! I worked in a restaurant that made their own fries. They always cut them fresh daily then put them in the coolers in vats of ice water to blanche. Otherwise they don’t bake or fry properly. So in love with these fries! Potatoes look delicious . I think it would be a good idea to post the weight of the potatoes as well as the size. That fry sauce is called Thousand Island dressing in California! It’s great homemade dressing. Made these a few times already. Delicious and easy to make. Hello, I was wondering if the parm cheese was the one you use for spaghetti or if it is the chunk you grate yourself? I’ll try it soon! I’m definitively in love with baked potatoes. These look so good, I can hardly wait to try them. Did you peel the potatoes before cutting into wedges? I’m wondering if I make these in advance for event, and we warm them when we get there, would they be okay? Yes, if you put them back in the oven they will warm up just fine. I would try and make them the same day though so they are still crispy. I’m going to make these in a few minutes, to be eaten with some wings! They look so yummy! Thank you for this recipe, I will let you know how mine was eaten! 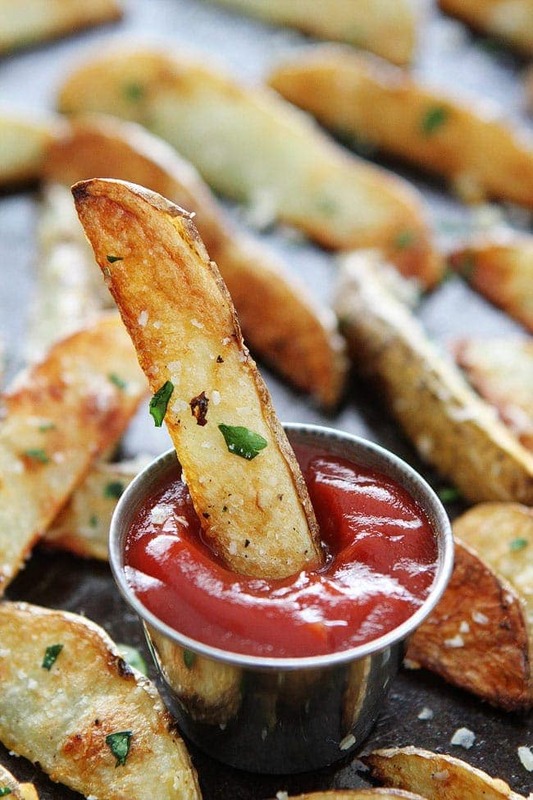 These wedges look delicious, and much healthier than running through the drive thru! Super easy and delicious potatoes. The ice water step really worked. I had never heard of that before. My sons loved them. Thank you. How many calories are in these when you’ve finished cooking them? These look so delicious!! Thank you! I’m very curious to the reason for soaking the wedges in cold water for 30 minutes. Would this be to draw out the starch possibly? These look sooo good. I will definitely make them! These were the BEST potato wedges we have every had. Have to be honest was on the phone so I couldn’t flip them mid way through but still the BEST. I think the icing the potatoes made the difference. This will me made again. You know they were good- my first comment. My fries stuck to the parchment paper when I flipped them, does anyone have any idea why that happened?